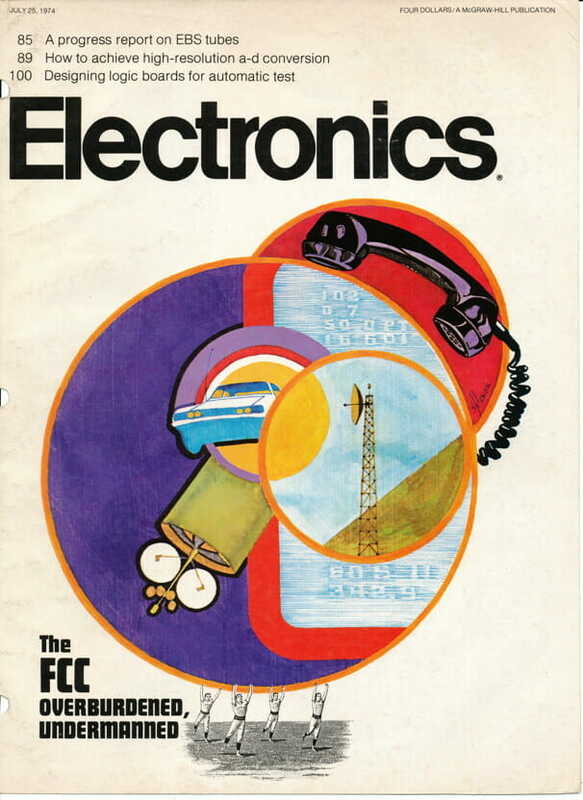 This was my first published article, and fell out of my work on the homebrew 8008 system that is now in the Computer History Museum (that link includes four detailed photos). It’s basically a one-way simple UAR/T, though those devices were pricey back then… and the design induces the host micro to wait while a character is sent (an interrupt would be better, of course, but my primitive software wasn’t doing anything else at the time). Of course, now one would eschew expensive external hardware and just use a port bit, but this was 1974 and static RAM locations were a scarce resource. This article had the effect of kindling the crazy notion of writing about my projects, and that became a career. I was 22 at the time, living in an apartment in Kentucky, doing all I could to escape employment. 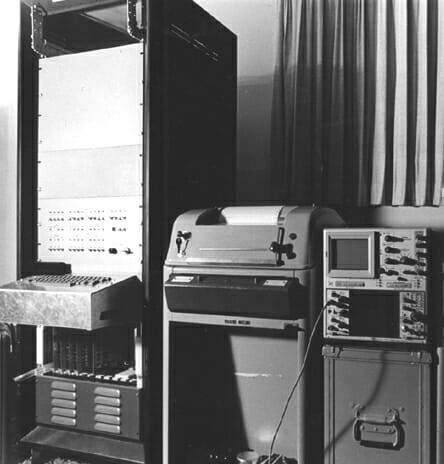 A photo of my living room, including the machine and the amazing Model 28 teletype, is below the article. The lengthy software service routine generally required to interface a teletypewriter and an IC microprocessor, such as the Intel 8008, can be eliminated by the circuit shown here. A shift register and some control logic are all that it takes, bringing total component cost to only about $6.50. During the time that the input parallel data is valid, the circuit receives the START pulse, which sets the BUSY flip-flop and takes the READY line low. The BUSY flip-flop also removes the reset from the cycle counter and enables the LOAD flip-flop, which is set on the next clock pulse. This action loads the data at the input to the shift register and increments the cycle counter once. On the succeeding clock pulse, the ENABLE flip-flop is set, and the data in the register begins to shift to the right. For each shift pulse, the cycle counter is incremented by one until it reaches a binary count of 8. Then, the BUSY and ENABLE flip-flops are both reset, and the READY signal is restored to the microprocessor so that the central-processing unit can resume operation. In the data character presented to the shift register, bit H, which is constantly held low, corresponds to the teletypewriter START pulse. Similarly, the register’s A and B bits are tied high, corresponding to the teletypewriter STOP pulse. Since the STOP signal must be applied to the teletypewriter for approximately 1.5 times longer than the other pulses, the BUSY flip-flop is reset on the falling edge of the clock, during the time that bit A is present at the register’s QH output. The serial output of the register switches the 60-milliampere teletypewriter current loop through the transistor. The clock signal for the circuit is derived from the IC timer that is free-running at approximately 75 hertz. For teletypewriters that operate at 6 characters per second, the clock frequency should be about 45.5 Hz. Software bypass. 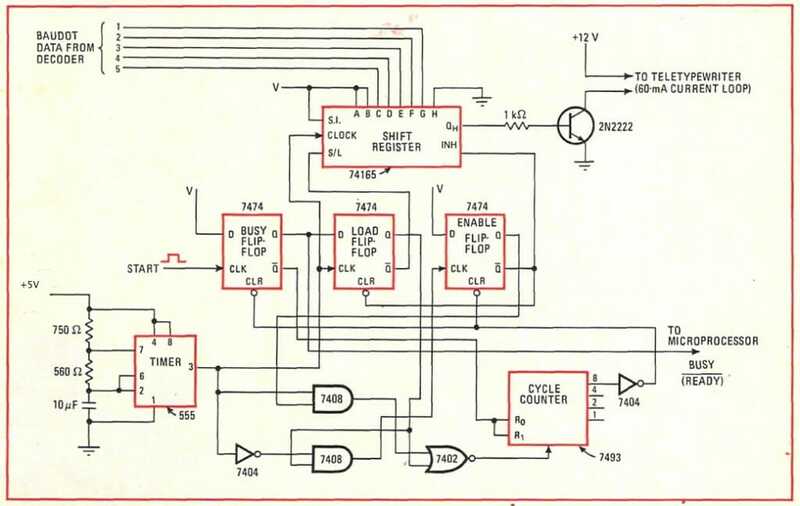 Digital Interface circuit provides synchronization between a teletypewriter and a microprocessor chip through the latter device’s READY line. Normally, a long software routine is needed to make the interface. The input data is in the parallel Baudot code, and the output is for a 10 character-per-second teletypewriter. A free-running IC timer is used to produce the clock signal. 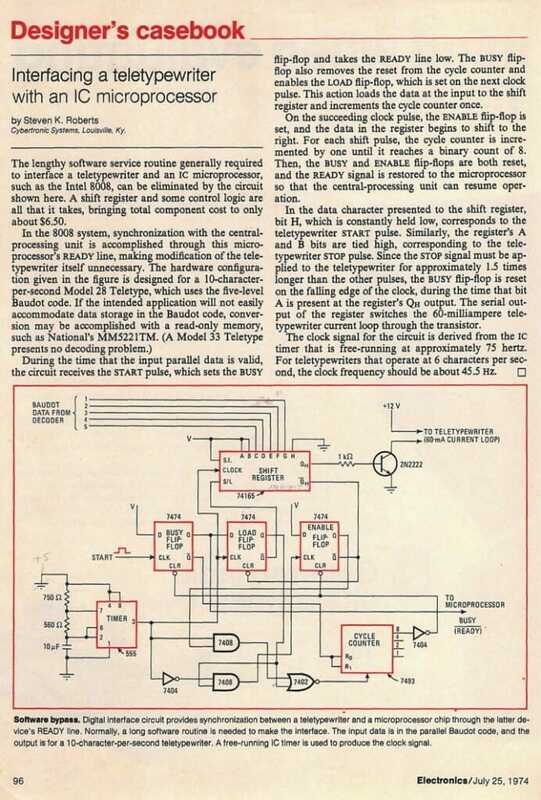 Note two corrections in this schematic relative to the full-page image at the top of the article: +5 at the top of the RC network of the 555 timer, and INHIBIT input instead of the complementary Q output of the 74165. 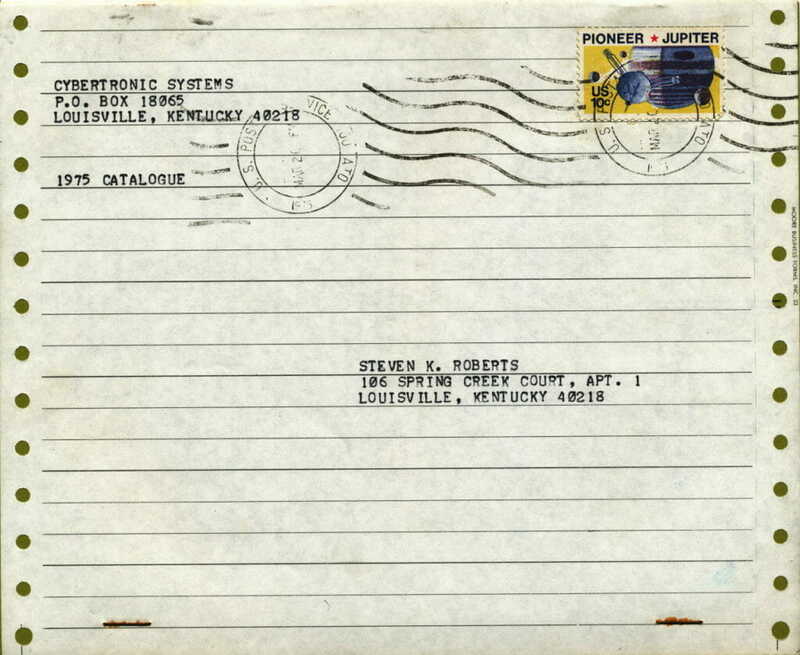 In 1974-75, I used that Model 28 heavily… including generation of wrappers for my parts catalogs, working from a database I kept on fanfold paper tape. The schematics of the 8008 may be found here.